On March 8, Orthodox Christians pay tribute to the memory of the Matrona of Moscow. One of the most revered saints everywhere loved and continues to perform miracles of healing, even after the completion of the earthly path. The Orthodox appeal to her with prayers for the fulfillment of their innermost desires, and also ask her for patronage and protection. A lot of proven and reliable facts reached our times. The stories of people about miraculous healing thanks to Matron are truly amazing. Her gift, sent from Above, put the hopeless patients on their feet. One of the cases of miraculous recovery occurred when Matrona was not even 17 years old. A man who could not walk turned to her. The girl told him to crawl to her, regardless of the flour. Witnesses confirm that he was out of his blessed house on his feet, completely healthy and full of strength. So now, many people find healing through prayers, believing in the power of the Most High. The future saint was born in a simple large peasant family. They wanted to give her upbringing to a shelter, because they were afraid that they could not feed so many children. However, Matrona’s mother saw a wonderful dream, in which she was a snow-white bird of extraordinary beauty, but blind. The baby was born after a dream and was absolutely blind. From a very early age, she had a wonderful gift of healing, could predict the future, and anticipated danger and misfortune. From the whole district, the sick and the weak came to the unusual eight-year-old girl. As a thank you, people left food and gifts to her parents, so Matrona became the real breadwinner of her large family and guardian of family happiness. At the age of 17, another misfortune befell her — her legs fell asleep, but the girl in no way showed despair, remained as kind and continued to help all the suffering. In order not to incur the wrath of the authorities, the girl moved to the capital of the Motherland, Moscow, where she continued to provide assistance. In the years of the Great Patriotic War, people with their troubles, problems and sorrow went to her in an endless stream. Matron did not accept any gifts, acting disinterestedly and with all my heart. She demanded only faith in the Lord. Her teachings were not based on severity, but on mercy. The future saint prayed for everyone, gave everyone valuable advice, guiding them on the true path and helping to resist sinful temptations. Predicted Matron and his death three days before his death. Until the very last days she did not leave her vocation and continued to provide assistance to all those in need. 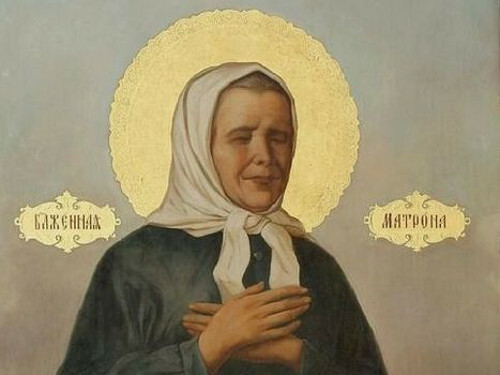 Blessed Matrona was buried at her request at the Danilovsky cemetery. Her burial became a place of pilgrimage, and in 1988 the church acquired her relics, which were transferred to the Pokrovsky Monastery, where they are still located. On March 8 of the year, Orthodox Christians will visit the church in order to celebrate in prayers the holy Matrona, her faith in the Lord, the righteous life and the gift from above. Appeal to the Matron of Moscow with a request for guidance, asking for healing from ailments, asking for protection and patronage. Believers come to church with a variety of requests, and there has not been a single case in which the saint would not help a sincere request. And after her death, she continues to protect the human race, giving replenishment to childless couples, eliminating financial difficulties, healing from fatal ailments. It helps to gain true faith in God, rely on his protection and live a righteous life, cultivating souls in piety. March 8, the year everyone can pray Matrona. For this, it is not necessary to go to church. According to Matrona’s own precepts, prayer should come from the very heart, excite the hidden corners of the soul and be sincere and righteous. “Matushka Matrona! Help the servant of God (name) in trouble (. ), Do not leave in a difficult hour when my hands fell, and you have no one to ask for advice. Pray to our Lord for protection and protection. Give me faith and hope in a bright future. “O Blessed Matushka Matrona! You live in two worlds, and your strength, given by the Lord, knows no bounds. You are in Heaven before His Gaze, yes you rest on earth. I beg you in humility, I bow my head. Deliver me from the torment and torment of the soul, inhale in your heart true love, sincere faith. I pray thee, O holy one, pray for my family before the Lord. Save us from human malice, dashing disease, and the evil one. And we pray for you, glorifying in the ages your righteous feats, our protector and healer. Amen». Matronushka herself said that everyone came to her with his misfortune. And all she sees and hears. And, of course, it will help in getting rid of doubts tormenting the mind and destroying the mortal body of diseases.